This example deals with a direct co-operation between man and machine. 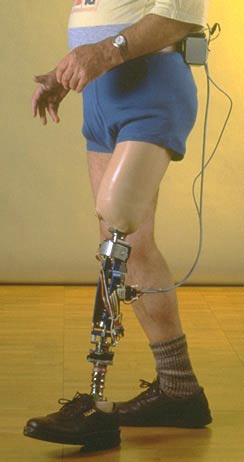 The above-knee prosthesis (see figure) can be seen as a robot that is, at least partially, replacing human walking functionality. As the normal and the prosthetic gait have a rather complex motion pattern, an intelligent control for the prosthesis was chosen as opposed to the classical methods. The selected approach is such that the behaviour of the system is governed by a finite set of rules. The pre-defined and stored parameters, models, and rules are combined to the knowledge base of the system. The soft control is algorithmic and composed of four sub-functions. The first task is gait state identification based on online measurements. Then the gait control computes the damping levels of the knee motion depending on the various gait phases. In order to realise that impedance control, an actuator opens and closes a valve in the hydraulic actuator connected to the knee joint. Thus the energy for controlling the impedance is very small; the major part of the energy for walking is still coming from the motion of the hip. Finally, the gait speed is identified, a parameter which influences both the gait control and the hydraulic control. A laboratory prototype of such a controlled prosthesis was built and evaluated in a rehabilitation clinic, showing a number of distinct advantages over classical prostheses. More information is given in " Daniel Zlatnik, Intelligently Controlled Above Knee Prosthesis. Diss ETH Zürich 1998"